The following chapter has been contributed by the author Camille O'Reilly, with the permission of the publisher. The views expressed in this chapter do not necessarily reflect the views of the members of the CAIN Project. The CAIN Project would welcome other material which meets our guidelines for contributions. This chapter is copyright Camille O'Reilly (1997) and is included on the CAIN site by permission of the author and the publisher. You may not edit, adapt, or redistribute changed versions of this for other than your personal use without the express written permission of the author or the publishers. Redistribution for commercial purposes is not permitted. Discussions about the Irish language tend to fall into tediously predictable patterns. It is hoped that this book will be a step towards an informed, critical and engaged debate. The essays here, which range from the personal to the scholarly, revisit old questions with new perspectives. Some of them bring fascinating new material to light for the first time. This is no dry academic work. All the contributors are involved with the Irish language movement, and the interplay of commitment and objectivity make for a stimulating read. The essays here are designed to stimulate constructive debate on the Irish language in Northern Ireland. In a society where communication takes the form of cliches being hurled back and forth across no-man’s-land, it is not always easy for Irish language enthusiasts to find the space for a reasonable discussion. This book represents an attempt to create such a space. The essays draw on a number of disciplines; history, anthropology, sociolinguistics, and four of them are based on doctoral research. The authors were asked to make their work as accessible as possible to the general reader, and to cut down on learned gobbledygook. Inevitably, some themes recur throughout the book. The relationship between political ideology and the language movement is discussed in all the essays, and a number of contributors offer varying interpretations of the role of Douglas Hyde. No attempt was made to impose order on such overlapping themes: in itself, the variety of opinion expressed here both reflects and contributes to the debate within the language movement. Much remains to be covered: Comhaltas Uladh, Irish-medium education and Irish in English-medium schools, the residual Gaeltachts within Northern Ireland in the early days of the state, the relationship of the Catholic church with the language movement, the gaelicising of west Belfast, the 1991 Census, Irish in the arts, economic activity, broadcasting, prisons. Further research is needed in all these areas. Our thanks are due to the contributors, to Colm Mac Aindreasa for knowing what buttons to push, to Séamus Ó hAnnaidh for his patience and creativity, and to Máire Bean Uí Bhruadair and Eibhlín Ní Chnáimhsí for their direct input and for keeping the show on the road when their colleagues were otherwise engaged. the Irish language and politics. The Unionist Government and the Irish language 1921-43. Protestant learners of Irish in Northern Ireland. Aspects of the Irish language movement. Can linguistic minorities cope with a favourable majority? The Irish language has been an important issue in the history of Ireland for centuries. Today, although Irish people are Irish whether or not they can speak Gaelic, the language nevertheless occupies a special symbolic position in the definition of a distinctive Irish identity. Irish has had a significant formal status in the southern state since its inception. Irish has become an increasingly important aspect of the national identity of many nationalists in Northern Ireland as well, where the current resurgence of interest is probably the most vibrant and widespread this century. In spite of the broad support that the Irish language enjoys among nationalists in Northern Ireland, however, the symbolic and practical meanings of both the language and the revival are strongly contested. In this essay, I will explore a number of different perspectives on the Irish language currently held by nationalists in the north. Attitudes to the Irish language cannot be separated from the immediate social and political context of Northern Ireland. Even though the remaining population of native Irish speakers in the six counties of Ulster which became Northern Ireland had largely disappeared by the time of partition, the Irish language movement survived and occasionally thrived. In a society which is fundamentally divided on political grounds, to learn or speak Irish is perceived as an act with political implications. Those who chose to do so inevitably have to define their own sense of how the language relates to their political identity. Different perspectives on the Irish language also have deep historic roots within Northern Ireland and in the island as a whole. Current attitudes towards the language owe much to the different ways in which that history is interpreted. Supporters of the language point out that the historic role of Irish in Belfast and the north has often been ignored in official’ versions of history. They believe that it is important to assert that Irish has always been a part of what is now Northern Ireland, and place great emphasis on the many revival activities which have been based in Belfast since the eighteenth century. The city has often been an important centre of the Irish language movement for the island as a whole. Competing interpretations of history and society both reflect and affect the distribution and exercise of power within society. The attitudes and relationship of Irish speakers to power structures are often reflected in the very language they use when talking about Irish. One powerful tool for interpreting people’s beliefs about Irish, and the implications of those beliefs, is to examine their discourses, or ways of talking about the language. A discourse can be identified by certain words or phrases which characterize that particular way of talking, or by certain patterns of speech. For example, the discourse of football commentary includes ‘hat trick,’ ‘goal’ and ‘offside,’ while the discourse of cookery includes ‘teaspoonful’ and ‘bring to the boil.’ None of us would have much trouble distinguishing between a sermon, a news report and a comedy routine after listening for just a few seconds or reading just a few lines. This is due in part to the different discourses used in each of these ways of talking. Discourse refers to much more than just patterns of speech, however. It is a linguistic vehicle for thought, emotions and ideologies. Successfully putting across your ideas or beliefs through discourse, and having those ideas accepted, is a form of power. Some theorists (notably Foucault 1972, 1982) see dominant discourses - frameworks of ideas which are unthinkingly accepted by those who use them - as means of perpetuating and reproducing particular ideologies and power relationships. My own conception of the way discourses are used is less rigid and ‘top down,’ and tends towards a more dynamic model. The ideology we use to express our experience of social reality is formed within the framework of existing discourses and is constrained by them, but it is also modified by the process of discourse. Discourses do not simply reflect the way people feel or what they believe - they are the place where these feelings and beliefs are actually formed and reformed, supported and challenged. In the process of speaking or writing, we all participate actively in the creation, reproduction and change of ideas and beliefs. If the function of a dominant discourse is to legitimize a particular set of power relations, it can be challenged by two separate processes. By engaging creatively with the dominant discourse within its own terms of reference, the discourse itself, and the power relationships it embodies, can be changed. On the other hand, a dominant discourse can be delegitimized or challenged through the failure to engage with it, or through the conscious use of alternative discourses. Both of these processes are at work within the discourses of the Irish language movement in Northern Ireland. Some directly challenge the legitimacy of the discourses which are directly linked with institutions of power. Others, while challenging those same institutions, are used within acceptably defined parameters of debate - for example the issue of ‘parity of esteem'1 or comparisons between the status of Irish and other minority languages in the United Kingdom. Certain aspects of some Irish language discourses have already been incorporated into the dominant discourses, particularly those linked to the discourses of community relations and cultural diversity. There is an ongoing process of negotiation taking place between the different discourses within the Irish language movement itself, and between the language movement and the dominant discourses. Recent attempts to construct a peace process may result in even more of these discourses being adopted by the institutions of power in Northern Irish society. Talk by nationalists about the Irish language in Northern Ireland can be divided into three separate discourses. While this breakdown is not exhaustive of all possibilities, it is representative of the bulk of nationalist opinion on the language. I have labelled these three ways of talking about the Irish language decolonizing discourse, cultural discourse, and rights discourse. Although individuals often mix discourses to suit their own purposes, for the sake of clarity I will focus on talk which draws primarily from just one discourse, looking at each of the three discourses in turn. Decolonizing discourse is often associated with Sinn Féin, although they by no means have a monopoly on the point of view associated with this discourse. Irish gained a very high profile during the hunger strike in 1981, partly because the first man to die, Bobby Sands, was an Irish speaker, and partly due to the increasingly widespread use of the Irish language to communicate amongst republican prisoners in Long Kesh. Sinn Féin’s involvement with the Irish language throughout the 1980s contributed a great deal to the current shape of decolonizing discourse, which is perhaps best typified by much of the rhetoric of Sinn Féin and a number of its prominent members. We only succeeded after we had begun to get back our Irish ways; after we had made a serious effort to speak our own language; after we had striven again to govern ourselves. We can only keep out the enemy and all other enemies by completing that task The biggest task will be the restoration of the Irish language (quoted in Ó Fiaich 1969: 111). The Gaelic League does not stand to take sides in the political differences that separate Irishmen into different parties, and therefore it is claimed to be non-political. This claim can only be upheld by twisting the plain meaning of the words ... It has confused the one straight issue for them, and that straight issue is whether the Irish nation or the English nation is to predominate in Ireland ... The Irish language is a political weapon of the first importance against English encroachment ... (quoted in Ó Huallacháin 1994: 66-67). The discourse in this quote bears some striking resemblances to decolonizing discourse as it is used today. It is important to realize, however, that decolonizing discourse in its present form is not simply a repetition of the words of the past, such as those quoted above. The words are similar, but used in the current social and political context of Northern Ireland they take on new meanings and new implications. There is an illusion of historical continuity promoted by the obvious surface similarities in discourse, past and present, which is important in establishing both credibility and a sense of community and history, at least among those who subscribe to the ideologies expressed through and created by this discourse. In the first half of the 1980s, decolonizing discourse was associated with quite an extreme ideology. Irish was literally seen as a weapon in the arsenal available to fight the British. A well known statement demonstrates this position. A prominent member of Sinn Féin, who is also an Irish language activist, has been quoted as saying ‘Every word of Irish spoken is like another bullet being fired in the struggle for Irish freedom.’ In the course of its development, decolonizing discourse seems to have been somewhat moderated. It would be somewhat unusual, for example, to hear someone make such a statement today. Although the most extreme versions of this discourse may be in retreat, the belief that the Irish language has an important political role and significance is still widespread, and this discourse is still drawn upon by some people in particular circumstances. The fundamental difference in each of the three discourses lies in the way in which the relationship between the Irish language and politics is conceptualized. In decolonizing discourse, Irish is made an integral part of party politics in general and republicanism in particular, identified as part of the process of decolonization. There is a strong naturalization of the connection with nationalism, and a strong connection with the republican struggle. The Irish language tends to be seen as inherently political. Certain key words, concepts and arguments indicate the use of decolonizing discourse: ‘resistance’ or ‘cultural resistance,’ ‘oppression,’ ‘reconquest,’ Irish as a ‘weapon,’ cultural ‘struggle,’ particularly as part of a wider anti-colonial struggle, and ‘republican,’ or a strong association made with republican ideals or beliefs. Discourses of anti-imperialism, de-colonization, or political struggle are frequently used in association with the Irish language. Connections are often explicitly made between a person’s nationalist political development and his or her interest in the language. Speaking and learning Irish are seen as political acts. Speaking Irish is also seen as a particularly powerful expression of national, and not simply ethnic, identity. I first got interested in Irish through politics. Everything I’m interested in stems from the politics I have. My introduction to anything cultural would be through politics. ... You can define struggle in different ways, and the importance of the Irish language came to the fore through Bobby Sands and the Gaeltachts in the jail. ... The people who came out of the jails were people you could relate to ... Maybe your best friend went to jail and came out as an Irish speaker and that would influence you, you know what I mean? Sinn Féin proclaimed loudly that the language question was political or that it was because of a political decision that Irish was taken from us in the first place. People must recognise that the anti-Irish campaign is interwoven with the British presence in Ireland. Irish people need to recognise that Irish will not magically reappear when the Brits go. The language suffered after the English came and it will recover before they leave. We also have to accept that having the language back will help bring an end to the foreign rule in Ireland. As the Irish influence rises, the foreign influence decreases. On the other side of the ideological fence from decolonizing discourse is cultural discourse. The clearest and most dominant feature of cultural discourse is the assertion that the Irish language and politics should be kept separate. The corollary is that the importance of the language lies in its beauty and cultural worth, not its political capital. What exactly is meant by politics, however, is not generally made explicit. Often the word political is used as a synonym for ‘republican. When a person says the language should be kept apolitical, they are often making a veiled comment on the perceived relationship of the Irish language to republicanism, usually casting it in an unfavourable light. Another common implicit meaning of ‘politics is party politics, or more specifically, sectarian politics. In this case, the belief is that the language should not be used to further the ends of any one political party, or that Irish should be kept as far removed from sectarian politics as possible. In practice, though, this still usually refers to republican politics, because Sinn Féin tends to take a high profile position on Irish language issues. Political acts in support of the Irish language, for example lobbying the government in support of Irish medium education or campaigning for greater funding for the language, are not necessarily condemned and may even be condoned. Approval or disapproval of this type of political activity largely depends on the context and on who is doing the campaigning. Siin Féin involvement might bring condemnation from some circles. Like decolonizing discourse, cultural discourse has a relatively long history. Probably the best known advocate of this view of the Irish language was Douglas Hyde, president of the Gaelic League from its inception in 1893 until his resignation in 1915. According to Hutchinson (1987), Hyde was a cultural nationalist embroiled in a classic confrontation with political nationalists. While cultural nationalists believe that only by returning to their unique history and culture could Irish men and women realize their human potential and contribute to the wider European civilization,’ political nationalists believe that ‘... only through the exercise of self-determination as citizens of an independent state could individuals find dignity’ (Hutchinson 1987: 2). Hutchinson argues that the two forms of nationalism articulate different conceptions of the nation and have diverging political strategies, as Hyde found to his cost. Hyde believed that for Irish to survive, it was essential to include people from all political persuasions in the revival movement. He tried to bring together all shades of nationalist and unionist opinion behind the common cause of the Irish language. However much the political pressure in favour of Home Rule increased, and in spite of the clear political implications of the activities of the Gaelic League during this politically charged period, Hyde continued to insist that his work and the work of the League were purely cultural (Dunleavy & Dunleavy 1991: 11). The pressure to make the Gaelic League overtly political increased during the period from 1910 to 1915. When Hyde felt that he could no longer keep the Gaelic League separate from the political maelstrom, he resigned from his position as president. The powerful association between Irish nationalism and the Irish language remains to this day, and it has once again become a serious issue of debate. Interestingly, Hyde is used by people of many different political views to justify their own stance. Hyde has been used by nationalists and unionists alike to suggest that the language revival movement has been hijacked by republicans. He has been used by advocates of cultural discourse to prove that the Irish language is there for all the people of this island regardless of their political or religious persuasion, and used by some unionists to prove that Irish is indeed a republican language. In its second guise cultural discourse has a clear political perspective of its own. The interplay between culture and identity is a key focus point. In some instances it is used as a political tool against decolonizing discourse, but its agenda is much broader than this. The focus on ‘culture’ is part of an attempt to create space for the growth and development of identities beyond the narrow boundaries which tend to confine definitions of ‘nationalist’ or ‘unionist’ culture. In this more political guise, cultural discourse often appears alongside the discourses of ‘heritage’ and ‘tradition.’ The Irish language has figured prominently in much of the discourse of Irish heritage, both in everyday speech and in ‘official’ quarters. Cultural discourse has been partly institutionalized under the auspices of ‘heritage’ through the Cultural Traditions Group (CTG), formally established in 1989 as a sub-committee of the government funded charity the Community Relations Council (CRC). The CRC is funded by the Central Community Relations Unit (CCRU), a section of the Department of Finance and Personnel. In this rather roundabout way, cultural discourse has been increasingly incorporated into the state discourses. It is increasingly necessary to use this type of discourse in order to obtain the support of major funding organizations, as well as local and national government. We strongly valued it [Irish] as a source of enrichment central to our cultural heritage. Indeed I believed that an effort must be made - by all sides - to release it from misunderstanding and prejudice, not use it as mere graffiti to exclude, confuse or taunt others (CTG 1994: 6). ... the main object [of the Cultural Traditions Group] is to promote discussion and debate about the validity of the various cultural traditions in Northern Ireland in a constructive and non- confrontational atmosphere. One shorthand was to help Protestants to contemplate the Irish language without necessarily feeling offended by it, or for Catholics to look on Orange processions without feeling intimidated. Of course this rather begs the question that some Orange processions are indeed intended to assert a claim to territory, or to superiority, and sometimes to intimidate, and some manifestations of the Irish language are precisely employed in order to cause as much offence as possible to Unionists (CTG 1994: 9; ULTACH Trust 1991; italics added). In Hayes’s view, the Irish language can be viewed as a kind of shorthand’ for Catholic or nationalist culture, and presented to unionists as a non-threatening manifestation of that culture. This is not entirely consistent with the view expressed by Hawthorne above, where Irish is portrayed as belonging collectively to ‘our’ culture, presumably referring to a culture shared by both Catholics and Protestants. The problem is indicative of two conflicting versions of cultural traditions discourse. Hayes is drawing on the ‘two traditions’ version, while Hawthorne is using ‘common heritage’ discourse (cf. McCoy n.d.). This ambiguity in cultural traditions discourse3 gives it a certain flexibility which not only helps to widen its appeal, but makes it more resistant to attack. Either version of cultural traditions discourse - or both - can be drawn upon depending on the context. In the final sentence of the above quote, Hayes implicitly accuses at least some people of using the Irish language in an unacceptably political manner. The CTG makes a clear effort to place the Irish language firmly in the realm of culture and to ‘release it from misunderstanding and prejudice, not use it as mere graffiti to exclude, confuse or taunt others’ - in other words, they attempt to present the language in an inclusivist way in order to depoliticize it. The idea of establishing an independent trust to promote the wider use of Irish came out of the ‘Varieties of Irishness’ conference organized by the CTG in 1989 (the proceedings of which were published - see Crozier 1989). The conference concluded that ‘...the language had unfortunately become associated with Republicanism in the eyes of many Protestants, which was a distortion of its real cultural significance’ (CTG 1994:24). The following year, the issue of the Irish language was again discussed at the ‘Varieties of Britishness’ conference (see Crozier 1990). A seminar on law and administration concluded that ‘statutory or financial impediments to the use of Irish should be removed to enable those who wished to use it to do so more freely,’ while a seminar on educational issues said that ‘Irish had suffered from being seen in a politicised context which alienated those who wanted to retain their Britishness’ (CTG 1994: 24-25). 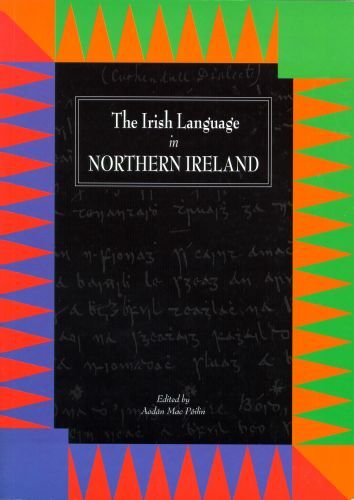 According to the booklet Giving Voices, the CTG was ‘quickly persuaded of the need to confer a new legitimacy on its use and the study of its origins and dialects, including its relationship to the Ulster-Scots tradition’ (CTG 1994: 25, italics added). Here, ‘to confer a new legitimacy’ can be read as a euphemism for depoliticizing the language, or broadening its appeal. Iontaobhas ULTACH / ULTACH Trust was formed in 1989, opening an office in Belfast city centre in 1990. In April 1991, the British government agreed to contribute £250,000 to the Trust’s capital fund, ensuring long-term viability and allowing the Trust to generate an independent income. 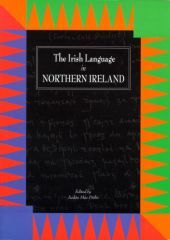 Its remit is ‘to promote the Irish language throughout the entire community of Northern Ireland.’ One priority of the ULTACH Trust is ‘...to make [Irish] classes available in areas in which people from the Protestant community will not feel threatened and to help create an environment in which they can comfortably learn and use the language’ (CTG 1994: 25). In practice this has sometimes been difficult to achieve. There is a great demand for funding and support for Irish language activities from people in the Catholic community who are already involved with the language, while on the Protestant side efforts are still being made to generate interest in Irish. This means that the Trust still funds a greater proportion of projects from the Catholic community, at the same time as it is working hard to implement its cross-community ideal. Through the establishment of the Cultural Traditions Group and the ULTACH Trust, particular interpretations of the meaning and importance of the Irish language have become incorporated into discourses which are favoured by the state. This has profoundly affected the development of efforts to revive the Irish language in a number of ways. For the first time an organization has been funded by the British government with a remit exclusively devoted to the Irish language. The significance of Irish has been officially recognized, although in a particular way which attempts to dissociate the language from an exclusive nationalist identity Perhaps even more importantly, one discourse of the Irish language has been given the official ‘stamp of approval’ and is now being used as the blueprint for further developments in relation to Irish. Effectively this means that other discourses are placed outside of circles of power, in opposition to cultural discourse which gains legitimacy by this association. Because cultural discourse is now associated with some of the primary sources of funding for the Irish language, it is becoming increasingly necessary to use this discourse in order to obtain financial support. Considering, however, that the symbolic meaning and importance of the language is so deeply contested, it is not surprising that there is still a great deal of debate on the issue. The image and meaning attributed to the Irish language by institutions associated with the government is considered more or less acceptable by the Irish language community depending on who you speak to. As with decolonizing discourse, there are certain key words, concepts and arguments which indicate the use of cultural discourse: ‘apolitical,’ ‘depoliticize,’ ‘inclusive,’ ‘tolerance,’ ‘understanding,’ ‘access,’ ‘multiculturalism,’ ‘pluralism,’ ‘beautiful language,’ ‘heritage’ or ‘common heritage’ and ‘cultural traditions’ (as distinct from traditions). Cultural discourse is often used in conjunction with the discourse of community relations. Accusations that the language is being politicized, or attacks on specific individuals or groups for politicizing Irish, figure prominently. A connection is frequently made between a person’s interest in Irish and its history, songs and literature. Speaking Irish is generally seen as a cultural activity, and it tends to be seen as an expression of ethnic or cultural identity (in contrast to the more dangerous and divisive political or nationalist expressions of identity). If decolonizing and cultural discourses can be seen as constituting two sides of a debate about the relationship between politics and the Irish language, then rights discourse can be seen as a means to sidestep this debate and to open up new ideological avenues. In rights discourse, there are two key, inter-connected elements which make it less straightforward than the other two discourses. The first element centres around efforts to break out of the confines of the political / apolitical dichotomy established by the first two discourses. In these discourses the terms of debate are more or less agreed - Should politics be kept separate from the Irish language, or is the language an integral part of political struggle? In the third discourse, issues which lead into political / apolitical deadlock are sidestepped through a variety of different strategies, for example ‘you can’t hijack a language... or arguments favouring the ‘multipoliticization’ of Irish, as well as other techniques of avoidance. The second element centres around efforts to broaden and reframe the debate over politics and the Irish language. In recent years this has been achieved primarily through the issue of rights for Irish speakers. Discourses of civil rights, human rights and minority rights have been adapted as a means of campaigning for the language and developing an ideology which attempts to break out of the confines of the political / apolitical dichotomy. For example, there is a common accusation made in some Irish language circles that Sinn Féin have ‘hijacked the language for their own political ends without genuine regard for the effect it might have on the language. A person who favours cultural discourse might agree with this statement, while someone who favours decolonizing discourse is likely to disagree. The most likely response of someone who favours rights discourse is to refute the idea that a language can be hijacked in the first place. In a sense, people who say ‘you can’t hijack a language’ are deliberately misunderstanding the accusation as a means of moving outside the restrictive framework of the debate. To address the accusation directly would mean becoming trapped in the political / apolitical dichotomy, so an alternative strategy of avoidance is used. The language as a symbol can, of course, be ‘hijacked’ in the sense that any symbol can be invested with new meanings. People who use this strategy, however, choose in this context to view Irish strictly as a language which anyone can learn or speak. In so doing, they implicitly deny its symbolic significance, at least in this context. Inevitably, perhaps, the first two discourses have developed in close relationship with each other. Fairclough points out that ‘discourse types tend to turn particular ways of drawing upon conventions and texts into routines, and to naturalize them’ (1992: 85). The ideologies of cultural and decolonizing discourses tend to manifest themselves as two opposing sides of a debate, and they carry with them an enormous amount of other ideological baggage. If a person draws too heavily or obviously from either discourse, it tends to imply that he or she agrees with the associated ideologies. With its emphasis on pragmatics and on the survival of the language, rights discourse is the most important medium of ‘multipoliticization.' Indeed, this discourse does tend to be used in a very political way. In terms of party politics, users of rights discourse often justify making Irish part of a party political agenda - in fact, they tend to encourage all parties to do so as a means of promoting Irish, multipoliticizing it, and / or weakening the connection made between Irish and Sinn Féin. In terms of the relationship between politics in general and the language, there is some naturalization of the connection to nationalism, but also attempts to break this connection and widen the appeal of Irish. It is neither pro- nor anti-republican, this debate being sidestepped and refrained as described above. Speaking Irish is seen as a right, a form of freedom of expression. In keeping with the notion that associations with the language ought to be broadened, individuals may see speaking Irish as an expression of national, ethnic, or cultural identity, or a combination of these. Talk of civil rights for Irish speakers is commonly associated with rights discourse, especially with reference to the funding of Irish schools and the right to use Irish when in contact with the state (for example on census forms, in court, and in government offices). Comparisons are often made with the status of Welsh and Scots Gaelic as a way of asserting that the British government is discriminating against Irish speakers, and by implication, all Irish people in Northern Ireland. Connections are also made with the issue of minority rights in a European context. Rights discourse is particularly strong in calls for parity of esteem, and in the process of elevating the Irish language to the position of litmus test for equality in recent political negotiations. It resonates with Irish speakers and many non-Irish speaking nationalists alike, making it a fairly powerful voice in current debates. Rights discourse is also signalled by particular key words, concepts and arguments: ‘rights,’ ‘civil rights’ and ‘human rights,’ ‘you can’t hijack a language,’ ‘equality,’ ‘parity of esteem', the responsibility of government to support minority cultures and uphold minority rights, and a denial that Irish can be wholly apolitical in the current sociopolitical context of Northern Ireland. Attempts are sometimes made to separate political allegiance from ethnic identity. And, importantly, the promotion of Irish is put above all other political and cultural considerations. I have a problem with people who don’t run around and promote the language. To people who say Sinn Féin has hijacked the language, I’d say go you and hijack the language. But I wouldn’t even accept the charge that they have. I would urge people who do think so to go and try to beat them at their own game. Even the Department has had to admit that the schools record of achievement is second-to-none. We believe that the decision not to fund Meánscoil Feirste was in fact an attack on the whole idea of an independent Irish-medium secondary level sector to the education system here. It is also a clear signal to all concerned that the idea of equality and parity of esteem for all traditions has not yet been embraced by the British government. Rights discourse both creates and is influenced by a different ideology about the Irish language, one which is neither apolitical nor narrowly attached to a single political perspective such as republicanism. While the above descriptions of decolonizing discourse, cultural discourse and rights discourse demonstrate the range of perspectives on the Irish language held by nationalists, it is important also to look at how these discourses are used in real life. Below are two case studies which show how the different discourses, and the different ideological perspectives which they carry, can come into conflict with each other and sometimes be the source of misunderstanding. There was some controversy over the ULTACH Trust after its founding in 1989. Much of the debate was rooted in the belief, held by many Irish language activists in west Belfast, that the ULTACH Trust was advocating an ‘apolitical’ view of the Irish language. The presence of unionist politicians on the Board of Trustees; the special efforts made to attract, or at least to not alienate, unionists; the criticism made of those nationalists and republicans who, in the perception of the Trust, are using the language for their own political gains; and the type of discourse favoured by the Trust, suggest to many that the Trust is promoting the depoliticization of the Irish language. The result has been a considerable amount of suspicion on the part of some Gaeilgeoirí, and even outright hostility amongst a minority. Critics of the ULTACH Trust can be loosely grouped into two camps, those who are suspicious of the very rationale behind the founding of the organization (usually, but not always, republicans), and those who welcome the founding of the Trust, but believe that it is flawed in some way. Members of Sinn Féin have expressed grave doubts about the motivations for the founding of the ULTACH Trust, drawing almost entirely on decolonizing discourse in their criticisms. They suggested it might be a government front, designed to regulate the Irish language revival by keeping control of its funding. Sinn Féin councillor and Irish language activist Máirtín Ó Muilleoir accused the government of having a deliberate policy designed to portray the Irish revival movement as sectarian, so that they could blame the decline of Irish on its association with nationalism rather than on their own policies. He suggests that that is the reason why funding for Irish has been tied to the Community Relations budget, rather than being treated separately as are Welsh and Scots Gaelic (Lá 5-8-93). Derry Sinn Féin councillor Gearóid Ó hÉara wrote that having failed in their policy to oppress the Irish language, the British government needed a more clever policy ‘leis na Paddies a choinneáil smacht’ - ‘to subjugate the Paddies’ - and that the ULTACH Trust was part of that policy (Lá 5-8-93: 14). The republican newspaper An Phoblacht (20-2-92) accused the NIO of trying to buy off the Irish language vote by setting up the Community Relations Council and the ULTACH Trust, while at the same time cutting funding for the west Belfast group Glór na nGael. Republicans have also complained that there is no Sinn Féin (or even SDLP) representative on the Board of Trustees, in spite of the many dedicated Irish language activists associated with Sinn Féin and the work they have done on behalf of the language. Aside from disagreements on how the Trusts money should be spent, the most common criticisms are that the Board of Trustees is unbalanced or not representative of the nationalist side, and that they, too, use the Irish language for political ends. An article in Irish in the Andersons town News (25-1-92) focussed on the latter point, although it is careful to temper its criticism by congratulating the Trust on its many accomplishments. The author softens the blow by suggesting that it would be dishonest not to raise the issue of problems which he or she sees with the Trust. The article then goes on to say that the first annual report of the Trust seems to side with the NIO on the issue of politicizing the language, because it says that some Irish language groups are alienating unionists by making it part of a nationalist political agenda. The article claims that this is inaccurate and insulting to Irish speakers, and asks for an explanation. It would be more fair, the article suggests, also to criticize the British government for using Irish as part of their efforts to entice nationalists away from Sinn Féin. A more recent article written by Gearóid Ó Cairealláin, the current president of the Gaelic League, addresses both the issue of the Board of Trustees being unbalanced and the politicization of the language (Andersonstown News 11-3-95: 24). Ó Cairealláin perceives a gap between the ULTACH Trust and the public caused in part by their political stance. He, too, criticizes the Trust for adopting the same stance as the NIO in opposition to Sinn Féin, suggesting that some members of the party are the most die-hard, diligent Gaeilgeoirí in the north. He argues that if there are unionist politicians on the Board of Trustees, it is only right that a Sinn Féin or nationalist political representative should also be on the board. This is the criticism of the ULTACH Trust which is, perhaps, the most disturbing to west Belfast Irish speakers. In its efforts to attract unionist support for the Irish language, some argue that the Trust is being unjust towards nationalists who are genuinely dedicated to the language. However, at present, the vast majority of language enthusiasts are nationalists, and, unfortunately, many of those nationalists fail to recognise that there can be any other rationale for involvement in the language movement. As a result, they often, despite themselves, make it difficult for interested unionists to learn the language. ... This problem arises from the fact that the cultural commitment of many Irish-speakers is inseparable from their political allegiance. Again, it should be emphasised that this is a perfectly justifiable ideological position: however, it is often accompanied by an assumption that unionists interested in Irish culture are well on the way to becoming nationalists. ... This unconscious ethnocentricity, rooted in an unresolved conflict between principles which claim to be non-political, and assumptions which are essentially political in their implications, is deeply ingrained in the Irish language movement (ULTACH Trust 1991: 8-10). I have quoted this section of the first report at length to illustrate the effort made to achieve a careful balance between support for attracting unionists to the language (without offending distrustful unionists), and criticism of some nationalist attitudes (without alienating the majority in the revival movement). The report asserts that a nationalist position in relation to the language is legitimate, but at the same time it sees this as worrisome because such a position contains an element of unconscious ethnocentricity. This position has contributed to bad feelings on the part of some nationalists, as is evidenced by the comments mentioned above. Aodán Mac Póilin, Director of the ULTACH Trust, is not unaware of the dilemma. He argues that for many, inclusive rhetoric about the language carries a different ideological subtext, one that in actuality excludes unionists. The Trust tries to make such inclusive rhetoric a reality, but this is not a simple task. As Mac Póilin sees it, a key problem lies in the weakness of Irish amongst the unionist population. This weakness means that the Trust must take positive action to promote Irish to Protestants. At the same time, the Trust is supposed to promote Irish throughout Northern Ireland to unionists and nationalists alike. While they must try to get unionists involved in the language, Mac Póilin emphasizes that the Trust has no right to undermine nationalist perceptions of the language. This dilemma has led Mac Póilin to seek an alternative to the political / apolitical dichotomy, which he attempts to do through the creative use of discourse and efforts to multipoliticize the language. Not all Irish-language activists are well-meaning, and, for a highly vocal minority, the language is an integral part of apolitical programme. Sometimes it is in the interests of these groups to encourage unionist alienation from the language, and to identify Irish ever more closely with the nationalist community (ULTACH Trust 1991: 10). In the ULTACH Trust’s Second Report, published in 1994, the emphasis on increasing the language’s cross community appeal is reiterated. It indicates a greater emphasis on Irish language education, from Irish medium schools and Irish as a school subject, to adult learning and the development of teaching materials. The new emphasis on funding Irish medium schools was due in part to the development of a capital fund, which gave the Trust greater freedom in the allocation of grants. The Second Report also seeks to define the Trust’s philosophy more closely with regards to its cross community emphasis. however, it is often more a process of creating the conditions through which Irish will become acceptable and accessible within all political traditions (ULTACH Trust 1994: 15). This is in keeping with Mac Póilin’s idea that the language needs to be multipoliticized, rather than depoliticized. Still, the notion persists among many west Belfast Gaeilgeoirí that the Trust, amongst others, are attempting to depoliticize the language, and that this amounts to a threat to their own perceptions of the meaning of the Irish language and importance of Irish culture to their ethnic and political identities, since ‘depoliticize’ is often used as shorthand for denying the validity of a nationalist or republican perspective on the language. A number of factors contribute to the persistence of the perception that the ULTACH Trust favours the ideology of depoliticization which is generally associated with cultural discourse. The ‘hands-off’ policy towards Sinn Féin and the Trust’s association with the CCRU fosters suspicion among some nationalist Gaeilgeoirí, as demonstrated in the above discussion of attitudes towards the Trust. The relationship with the Cultural Traditions Group, strongly associated with cultural discourse and the community relations ethos, tends to colour perceptions of the Trust as well. The perception of open and eager support for Protestant interest in the language, combined with a perceived lack of support for language initiatives and organizations in Catholic areas, also fuels suspicions. Taken together, these particular perceptions give some people the general impression that the Trust favours the ideology of cultural discourse, in spite of what is explicitly stated in its official reports. Glór na nGael is the name of an annual all-Ireland competition to reward the community which has done the most to promote Irish in everyday life, a sort of Irish language tidy towns’ competition. In 1982, the west Belfast committee of Glór na nGael was formed as an umbrella group for Irish language organizations to coordinate and facilitate entry into the competition, and to help promote the Irish language in Belfast. West Belfast was awarded a number of the more minor prizes every year starting in 1982, and in 1986, 1990 and 1996 west Belfast won the most prestigious prize, the Glór na nGael trophy for the overall best area. From its founding until its funding was withdrawn by the British government in 1990, Glór na nGael was involved in numerous activities. Initially the focus was on rights for Irish speakers, and the group was prominent in the bilingual street signs campaign of the 1980s as well as campaigns to increase the status of Irish in English medium schools, and for funding for Irish medium schools. Over the years, Glór na nGael has shifted its emphasis from campaigning to providing services for Irish speakers and learners. It holds Irish language classes in its own premises in west Belfast, and provides instructors for classes organized by other groups which are designed to attract both Protestants and Catholics, including classes and seminars in ‘neutral’ venues like the Ulster People’s College (which is funded by the ULTACH Trust). Glór also provides support and teachers for the Irish medium nursery schools’ movement, the organization’s primary focus at the time funding was withdrawn. In the months before the funding was withdrawn, there seemed little indication of the difficulties to come. The announcement that west Belfast had once again won first prize in the Glór na nGael competition came in March 1990. That same month, an editorial in the Andersons town News (31-3-90) congratulated west Belfast Glór na nGael for the work they had done to ‘bridge the gap’ between Protestants and Catholics through the Irish language. At this stage, Glór na nGael had twenty Action for Community Employment (ACE) workers, most of whom worked in Irish medium nursery schools throughout the city. The money provided by the government to support these ACE workers constituted the bulk of the organization’s funding, and allowed them to become involved in the community on a much wider scale than would have been possible with solely voluntary workers (although they did have a number of volunteers as well). On 25 August 1990, without warning, the west Belfast office of Glór na nGael received a letter from the Northern Ireland Office stating that their funding under the ACE scheme had been withdrawn. No explanation was offered in the brief letter, but reference was made to a 1985 statement by then Secretary of State Douglas Hurd, in which he said that funds would not be made available to groups when that funding would ‘have the effect of improving the standing and furthering the aims of a paramilitary organisation, whether directly or indirectly.’ Glór na nGael was not the first community group to lose funding under the new policy of ‘political vetting’ - among others, the Twinbrook Tenants and Community Association (west Belfast), Conway Mill (west Belfast), the Mac Airt Centre in the Short Strand area of east Belfast, Dove House in Derry, and the Glencairn Community Association in Protestant west Belfast all had had their funding withdrawn over the period of time since the Hurd declaration. The withdrawal of Glór na nGael’s funding was immediately interpreted by west Belfast Gaeilgeoirí as an attack on the Irish language and on west Belfast as a whole. Many people were clearly shocked by the actions of the British government, coming as it did on the heels of the announcement that the government would be funding the newly established ULTACH Trust. One article in the Andersons town News (1-9-90) listed a number of well-known and respected public figures who had recently sung the praises of Glór na nGael - including Minister for the Gaeltacht Pat ‘The Cope’ Ó Gallchóir, Bishop Cathal Daly, and Cardinal Tomás Ó Fiaich - as if to prove that the accusations against the organization were unfounded. Seven of Belfast’s eight Irish nursery schools, catering for approximately one hundred and forty children, were affected by the NIO ban which led to a cut in funding for Glór na nGael. None of the nurseries were receiving government funding of their own, so the loss of their Glór na nGael ACE workers was a severe blow. The schools were maintained through a variety of different fundraising drives, but the lack of ACE workers took its toll. Within weeks of Glór receiving the news, a campaign to restore funding was launched, starting with a picket on the Training and Employment Agency which had paid the wages of the ACE workers, and a letter writing campaign to then Secretary of State Peter Brooke. Glór na nGael’s ACE workers had been members of NUPE, the National Union of Public Employees, and the union also put their weight behind the campaign. Glór is also a member of NICVA, the Northern Ireland Council for Voluntary Action, which also protested against the policy of political vetting and came out in support of the organization. The committee of the Shaws Road nursery school accused Brooke of ‘an attack on our culture and language,’ and the Trustees of the ULTACH Trust took the unusual step of writing to Brooke asking him to reconsider his decision (Andersonstown News 15-9-90). The final sentence appears to be a veiled reference to the ULTACH Trust and the new government policy on the Irish language. 'Government buzzwords' seems to be a reference to certain aspects of cultural discourse, which has become increasingly important to the acquisition of funds for Irish language groups. Certainly Brian Mawhinney’s patronising claim yesterday that the money is designed to take the Irish language out of politics will be the cause of much mirth in the Glór na nGael offices. But then the parents of the eight nursery schools, run by Glór na nGael and denied funding since August last, know all about the Minister’s determination to keep politics and the language separate - all politics that is except his own (Andersonstown News 6-4-91). Clearly, resentment over the treatment of Glór na nGael reinforced some people’s suspicions about the ULTACH Trust and increased mistrust of NIO motivations in funding the Irish language. After a few months, the campaign to have funding restored was stepped up. A case of maladministration was taken up with the Northern Ireland Ombudsman, a petition to Peter Brooke was started, the Dáil was lobbied, and Glór na nGael offered to publish its accounts for all to see. Messages of support came in from many different quarters, from Labour’s shadow Northern Ireland Secretary Kevin McNamara to Boston Mayor Ray Flynn. In December 1990 SDLP deputy leader Seamus Mallon tabled over twenty parliamentary questions on the issue. The British government, however, remained silent throughout the eighteen month campaign to regain funding, declining to comment when enquiries were made by journalists and refusing to give further details as to why funding was withdrawn. An appeal for a review of the decision was made soon after the withdrawal of funding, but it was dismissed by the NIO without comment in October 1990. When Glór na nGael tried to gain access to documents regarding the NIOs decision to withdraw funding, their request was blocked by the issuing of a public immunity certificate. They then sought a judicial review in an effort to gain access to the documents, arguing that they could not defend themselves if they were not allowed to know the precise allegations which were being made against them. However, in a decision released in March 1991, the court decided against the case. In the end, Glór na nGael was never allowed access to any documents regarding their case, and no evidence was ever presented against them to support the allegations of paramilitary links. Rumours, however, were rife. Some people believed that Glór was vetted because a prominent Irish language activist who is also a Sinn Féin councillor was a member of the committee up until a few months before funding was withdrawn. To counter this, it has been argued that this person was a founding member of the organization and active with the group since 1982, so why was ACE funding granted in the first place? Besides, since this person had left the committee before funding was withdrawn, why was Glór na nGael’s appeal of the decision denied when the government must surely have been aware of this fact? If the involvement of people with republican sympathies was the problem, again, republicans had been involved in the founding of the organization. Rather than reflecting any strong republican sympathies in the Irish language movement, some people have suggested that this is because republicans are relatively thick on the ground in west Belfast, so you are bound to find people with republican sympathies in almost any type of group or organization, from tenants associations to church groups. About the only evidence that could be mustered in support of the governments allegations against Glór na nGael came after funding had already been withdrawn. A former ACE worker with Glór na nGael who was once on the committee was later arrested and charged with paramilitary related offences. Not surprisingly, perhaps, this incident was downplayed and was not widely reported by the nationalist press. Labour’s Kevin McNamara pointed out at the time that had all employers lost funding when staff were charged with criminal offences, the whole economy would grind to a halt, including the security forces’ (Irish News 28-3-92). More importantly, perhaps, this person was not on the committee of Glór when funding was withdrawn, nor at the time of his arrest. None of the speculation about the alleged paramilitary links attributed to the committee of Glór na nGael seemed to offer a satisfactory explanation for the withdrawal of funding. For west Belfast Gaeilgeoirí who were familiar with the organization and friendly with the members of the committee, there was no logic and certainly no truth in the accusations. Alternative explanations for the denial of funding were suggested by some of the more conspiratorially minded. Perhaps the NIO was less interested in alleged paramilitary links and more concerned with the threat that the Irish language movement posed to the British government. A series of high profile campaigns about the status of the Irish language in schools and funding for the burgeoning Irish medium education movement were embarrassing for the government, which was trying to promote a new image of equal respect for the ‘two traditions’ in Northern Ireland. According to this line of thought, the ULTACH Trust was established to prove the government’s credentials in supporting the Irish language, and funding was removed from the less domesticated Glór na nGael to help bring the movement under control. Others saw it as a personal vendetta on the part of the former Minister for Education, Brian Mawhinney, who was attacked by Glór na nGael for his education proposals which would have reduced the status of the Irish language in secondary schools. As the high profile campaign continued and gained increasing support at home and abroad, rumours surfaced that there were splits in the civil service over the decision to cut Glór na nGael ‘s funding. Some people believe that those who made the decision were reprimanded for their handling of the situation. The Royal Ulster Constabulary continued to grant permission to Glór to make street collections during the period of the ban, perhaps indicating conflicting intelligence between the RUC and NIO sources. The sustained questioning and publicity was clearly becoming embarrassing for the NIO. The Irish News reported that a ‘reliable source’ told them that certain people were ‘rapped hard over the knuckles because it was felt they had drastically underestimated the ensuing controversy (28-3-92). Whatever the reasons behind the NIO’s decision to withdraw funding from Glór na nGael, it seriously heightened hostility towards the British government on the part of the Irish language movement, as well as fuelling suspicions of the ULTACH Trust. There was resentment at what was perceived by many to be an effort to rein in and control the movement, first through the manipulation of funding, and second by efforts to promote an ‘acceptable’ stance on the role of the Irish language in Northern Ireland. Increasingly, it seemed, there was an official line to toe when dealing with government agencies and funding bodies with regards to Irish. A certain discourse had to be used, particular buzzwords’ employed, to get grants and official approval. The conciliatory ‘feel good’ language of cultural discourse has become increasingly favoured, although even this does not guarantee support. There was also resentment at what was perceived by some to be an effort to force the community to police itself and marginalize republicans. In the Irish language movement, as with many other community groups, this would mean shunning a number of important activists and in some cases, personal friends and colleagues. The Glór na nGael controversy highlights a number of important issues. It clearly demonstrates the often antagonistic relationship which exists between large sections of the Irish language revival movement and the British government. It is also revealing in terms of Glór na nGael’s place in the revival movement in west Belfast. For the most part, the movement closed ranks behind Glór, as did NUPE, NICVA, the ULTACH Trust and civil rights organizations such as the Centre for Research and Documentation (CRD) and the Committee on the Administration of Justice (CAJ) (cf. The Political Vetting of Community Work Working Group 1990). However, it also revealed some dissension, particularly on the issue of to what extent the Irish language movement should rely on, or become dependent upon, government funding. The controversy also provides a glimpse into the struggle to define the meaning and importance of the Irish language to Irish identity and nationalist political aspirations. Glór na nGael used confrontational tactics in its campaigns to increase the profile of Irish and defend the status of the language in education. Although this was combined with seminars, Irish courses, publishing projects and more moderate politics as well, it was the confrontational aspects of their work which drew the attention of the NIO. As a grassroots organization in west Belfast, it became associated with nationalist politics, even though Glór na nGael made some of the first concerted efforts since the Troubles started to provide neutral access to Irish language classes in Belfast. In spite of these efforts, Glór na nGael did not conform to the more conciliatory two traditions / common heritage image which the British government wished to promote. In order for the Irish language to fit into the community relations project, its strongly nationalist and republican image had to be shed, or at least neutralized. The establishment of the ULTACH Trust and the acceptance of the CTG’s interpretations of the significance of the Irish language were part of that project, as is the strategic use of funding to support groups and organizations that fit the desired image and ideology. The British government policy of vetting ‘undesirable’ community organizations was officially shelved in 1995, but not before it had a profound effect on the Irish language revival movement. Glór na nGael regained its ACE funding in March 1992 after eighteen months of campaigning. No explanation was offered, other than the suggestion made by Peter Brooke that circumstances had ‘changed significantly,’ a suggestion which Glór na nGael denies, since the membership of the committee and the work of the organization had not changed since funding was withdrawn in 1990. During the period of the campaign to restore funding, perhaps due in part to the Glór na nGael controversy, the ideology associated with cultural discourse made significant headway. It has become increasingly necessary and desirable to use this discourse, especially when dealing with government bodies, funding agencies and those ‘outside’ of the revival movement. At the same time, other discourses are still used in different situational contexts, and rights discourse still figures prominently in many campaigns. The meanings associated with the Irish language in the nationalist community are not as straightforward as they are often portrayed. I have tried to show this by arguing that talk about the Irish language and the revival movement constitutes three discourses - decolonizing, cultural, and rights discourse. Not only do these competing discourses influence the differing ideologies and meanings associated with the language, they are the place where these meanings are created and debated. A certain amount of struggle and negotiation are still taking place as to which discourses, or which parts, will be most widely accepted. While cultural discourse is widely used and considered largely acceptable by most authorities, decolonizing discourse is now less common and is considered to be illegitimate by government authorities and unacceptable to many Irish speakers. Rights discourse is highly political but not necessarily republican, and is favoured by many Irish language activists and features strongly in many funding campaigns. Each of the discourses is handled by institutions of authority in different ways. By incorporating aspects of cultural discourse into official or mainstream discourse on culture, tradition, and heritage, attempts have been made to neutralize the impact of decolonizing and rights discourses. Sometimes alternative discourses are suppressed, either directly (for example, removing funding from a controversial organization such as Glór na nGael), or indirectly (by attempting to delegitimize a particular discourse or certain aspects of it). There is also the option of simply ignoring an alternative discourse, hoping that it will lack the power, or that its users will lack the stamina, to press forward its ideological position. The purpose of this essay is not to condemn or condone any of the views presented. Rather, I hope that this discussion will help to clarify some of the issues of debate regarding Irish in the north today, and to show that there is not one uniform nationalist position on the language. In her analysis of the Breton language, McDonald (1989) argues that there is no language external to the social context of its evaluation and use. This is nowhere more evident than in Northern Ireland. The variety of opinion on Irish language issues, nationalist, unionist and otherwise, should be seen as a good thing. It is my hope that open and informed debate, rather than doing harm, will help to strengthen the Irish language and its position in Northern Ireland as a whole. Crozier, M. (ed.) 1989. Cultural traditions in Northern Ireland: varieties of Irishness. Proceedings of the Cultural Traditions Group Conference. Belfast: Queens University, Institute of Irish Studies. Crozier, M. (ed.) 1990. Cultural traditions in Northern Ireland: varieties of Britishness. Proceedings of the Cultural Traditions Group Conference. Belfast: Queens University, Institute of Irish Studies. Dunleavy, J. F. & G. W. Dunleavy, 1991. Douglas Hyde: a maker of modern Ireland. Oxford: University of California Press. Foucault, M. 1972. The archaeology of knowledge. London: Tavistock. Foucault, M. 1982. The order of discourse. In Language and politics (ed.) M. Shapiro. Oxford: Blackwell. Hutchinson, J. 1987. The dynamics of cultural nationalism: the Gaelic revival and the creation of the Irish nation state. London: Allen & Unwin. Mac Póilin, A. 1989. Presentation on the theme of cross-cultural connections. Learning Links Communities, NJCEA Conference, 24 June 1989. Unpublished. McCoy, G. n.d. Protestants and the Irish language in Northern Ireland. Unpublished PhD thesis, Queens University of Belfast. McDonald, M. 1989. We are not French! language, culture and identity in Brittany. London: Routledge. Ó Fiaich, T. 1969. The language and political history. In A view of the Irish language (ed.) B. 0 Cuiv. Dublin: The Stationary Office. Ó Huallacháin, C. (Fr.) 1994. The Irish and Irish: a sociolinguistic analysis of the relationship between a people and their language. Dublin: Irish Franciscan Provincial Office. The Political Vetting of Community Work Working Group 1990. The political vetting of community work in Northern Ireland. Belfast: Northern Ireland Council for Voluntary Action. ULTACH Trust annual report/Ion taobhas ULTACH tuairisc bhliantuil 1990-91. 1991. Belfast: ULTACH Trust. ULTACH Trust: second report/Iontaobhas ULTACH: an dara tuairisc 1991-93. 1994. Belfast: ULTACH Trust. 1. First used around the time of the Downing Street Declaration, the term ‘parity of esteem’ was quickly adopted by Irish language activists, who saw the treatment of Irish as a sort of litmus test for its implementation. 2. In this case, the speaker is using ‘military’ to refer to the republican ‘armed struggle’ rather than the Irish or British army. 3. These terms carry a similar ambiguity when used in the context of other discourses. For example, the two traditions idea meshes well with the concept of parity of esteem and the assertion made by many nationalists that Irish is ‘our own language.’ On the other hand, the common heritage idea meshes with the widespread assertion made by many nationalists that the language belongs to both Protestants and Catholics. Aodán Mac Póilin of the ULTACH Trust argues that many nationalists do not think through the implications of this terminology For example, he suggests that the term ‘our own language’ actively excludes non-Catholics and non-nationalists (Mac Póilin 1989; ULTACH Trust 1991). 4. Fifty per cent of the Trust’s funding goes towards the support of Irish medium education.